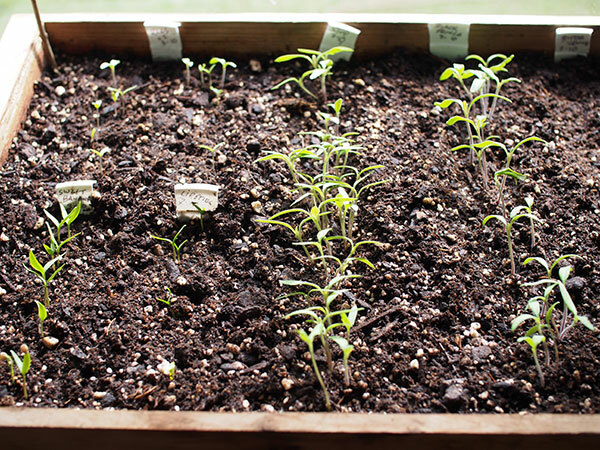 “Spotting On” or “Pricking Out” refers to separating and potting up tiny just-emerged seedlings. You can use this technique to germinate a lot of seed in a small container. That’s useful when you have older seed or home-saved seed that you’re not sure will germinate well. You’ll be able to maximize space in your best seed-germinating set-ups (like heat mats or germination tanks). Transplanting tiny seedlings also saves the heartache of thinning. 1. Handle tiny plants by the roots or leaves. The stems are irreplaceable and easily crushed, killing the plants. Roots and leaves can easily re-grow! 2. Spot on when the plants are still tiny, as soon as the cotyledons (seedling leaves) have spread out and turned green, or before. You will probably find the plants are at a mix of stages — there may be some seeds just below the surface that are just barely sprouted. These can be potted up as well! 3. Carefully remove small sections of plants and gently tease apart the roots. I like to use the tip of a hori-hori to dislodge the plants. 4. Have the new pots or flats ready to go, with the potting soil appropriately moist. 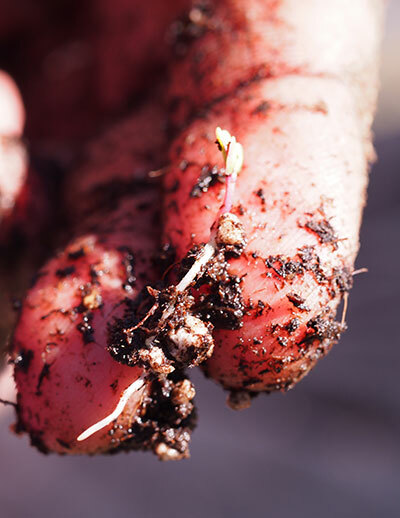 Once you start separating seedlings, the roots can quickly dry out, so plan to move any plants that will be exposed. 5. Push aside the soil with a popsicle stick or similar tool to make a hole. Holding the plants by a leaf, place in the hole. Try to keep the root pointing downwards. 6. Press down on the soil around the base of the plant to ensure good soil contact (this prevents drying). Gently water straightaway. If transplanting into a flat, you should water the whole flat again when it’s full. Ta-da! You can save dozens or hundreds of plants by using this method rather than traditional thinning! Give your extra seedlings to friends, donate them to community gardens, or dig yourself extra garden space and plan to preserve the bounty of your garden!